Mealtime is a wonderful opportunity to strengthen family ties and pass on cultural traditions! A Harvard study found that eating family dinners together most or all days of the week was associated with eating more healthfully! Families generally consumed higher amounts of important nutrients such as calcium, fiber, iron, vitamins B6, B12, C and E, and consumed less overall fat, compared to families who “never” or “only sometimes” eat meals together. Encourage your kids to help prep meals, set the table and help with the dishes. Snap the green beans, snap peas, or break the florets from broccoli and cauliflower. Family meals don’t have to be complicated, think soups and sandwiches, soups can be prepared on the weekends and heated throughout the week, they are easy to freeze too! Pack a variety of veggies into soup to create a powerfully nutritious meal. Sandwiches take minutes to prepare and typically a kid favorite – they’re transportable too so if you need to hit the field, you can easily wrap a sandwich to-go! No matter how simple or complex the meal, the important thing is to enjoy each other’s company and listen to each member of your family over a delicious meal. I love the combination of something sweet and salty, in this meal I have paired a sweet butternut squash soup with the salty and savory cured ham and egg cheese sandwich. HEAT oil over medium heat in a 6-quart stockpot. Add onions and sauté until soft but not brown, about 5 minutes, add in garlic and sauté for 2 more minutes. ADD the butternut squash and broth, bring to a boil. Reduce heat and simmer for 20 minutes. Add cooked carrots and continue to simmer until squash is fork tender, about 20 minutes more. Remove from heat. 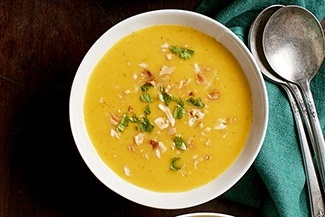 Puree with an immersion blender or in batches in a blender until smooth. Stir in curry powder and season with salt, to taste. Cook ham in large nonstick skillet over medium-high heat until crisp. Set aside. Meanwhile, spray a nonstick skillet with cooking spray and heat over medium heat. Crack eggs into the skillet and cook until whites are set, about 2 minutes. 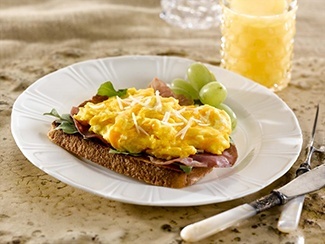 Top each egg with 1 slice ham, 1 slice cheese, continue to cook until yolks are set, and cheese is melted 2 minutes more. Place cooked eggs atop each slice of whole grain toast and then remaining bread slice. Cut in half and serve immediately.